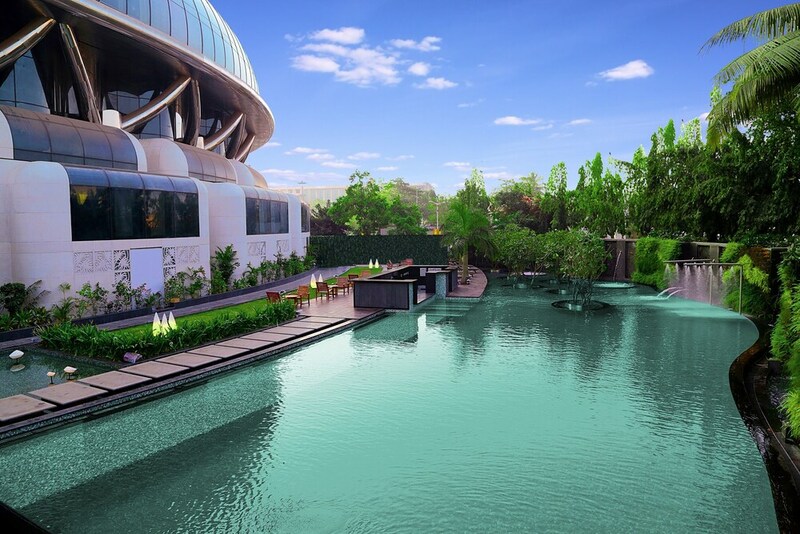 Located in Western Suburbs, this luxury hotel is 2.7 mi (4.4 km) from University of Mumbai and within 6 mi (10 km) of Bandra Kurla Complex and Bombay Convention & Exhibition Centre. Sanjay Gandhi National Park and Mt. Mary Church are also within 9 mi (15 km). Mumbai Vile Parle Station is 14 minutes by foot. Along with 5 restaurants, this hotel has a full-service spa and an outdoor pool. Free WiFi in public areas and free valet parking are also provided. Other amenities include a health club, a bar/lounge, and 24-hour room service. All 354 rooms offer free WiFi, 24-hour room service, and TVs with cable channels. Guests will also find coffee makers, free newspapers, and free bottled water. A business center is on site at this 5-star property. This luxury hotel also offers concierge services, laundry facilities, and dry cleaning/laundry services. For a surcharge, a roundtrip airport shuttle (available 24 hours) is offered to guests. Onsite valet parking is complimentary. The Earth Plate - This restaurant specializes in international cuisine. Guests can enjoy drinks at the bar. Open 24 hours. Open daily. Namak-Indian Specialty - This restaurant specializes in Indian cuisine. Open daily. East Asian Spice Trail - This restaurant specializes in Asian cuisine. Open daily. MANUHAAR – PURE VEG THALI - This restaurant specializes in vegetarian cuisine and serves lunch and dinner. Open daily. Mabruk-Mediterranean - This restaurant specializes in Mediterranean cuisine. Open daily. Couples wishing to share a room must provide proof of marriage. Only registered guests are allowed in the guestrooms.